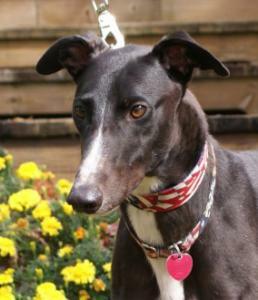 Fitz is a gorgeous, happy, friendly guy that just arrived from Derby Lane in Florida. He is a big guy racing at 82lbs. His sire is Group Rooster and his Dam is Cool Princess. Fitz's birthday is May 2nd and he is 2 years old. Fitz is a very loving boy that has settled right into his foster home without any problems. They think he would be a great dog for a first time greyhound owner because he is so good. He gives little kisses and likes to play. He crates nicely and is quiet in his crate so might do OK in an apartment or townhome. Fitz is a great guy that passed his cat and small dog tests so should be able to live with either.